Giles Newman's educational and working background is within photography and graphic design, and he has only recently taken up woodcarving in a serious way. "Up until this last year my woodcarving experience consisted of just carving simple spoons and cups during downtime while staying in the woodland that I help to manage in North Wales. 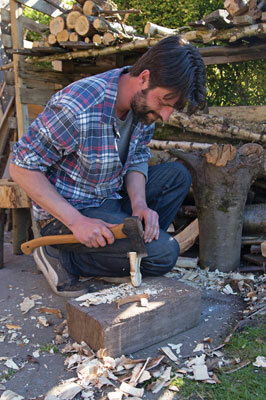 The woodland supplied me with plenty of timber to learn and experiment with and over the 10 years or so of spending regular weekends out there I suppose I gained in confidence with the basics of hand carving and whittling." Last year a family friend saw a few of Giles' pieces and suggested that he look to do more with the craft. Things have developed quickly from then on. "Excited by the prospect, I started to plan my first 'art' spoons. 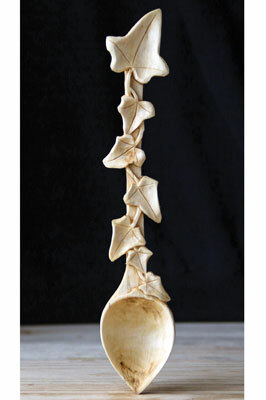 By the New Year I had sold my first couple of spoons and was rapidly evolving the decorative aspect of my carvings. Over the past several months I have taken to carving every day, around my day job as a graphic designer, and I have been utterly astonished by the response my work has received. I have received commissions and sales from around the world and built friendships with many incredible artists and craftspeople through my presence on Instagram." 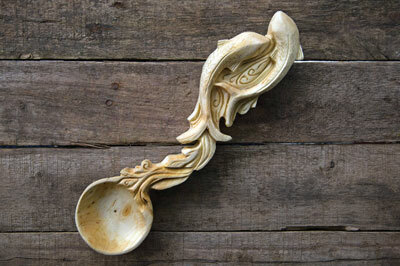 Giles' favourite piece is his koi carp spoon in silver birch (Betula pendula). "It was by no means the most complex or time-consuming carving that I've done but I loved the challenge of trying to capture a sense of movement in wood. I also like the reference back to traditional Japanese art that inspired the piece." 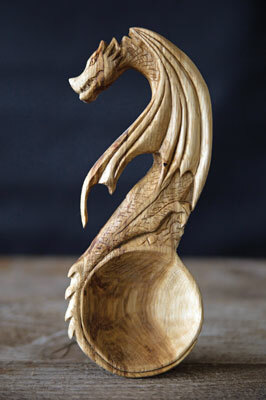 His research for the Koi spoon also led him to carve another of his favourite spoons, the 'Oak Dragon'. "This particular spoon was a real challenge for me at the time and the learning curve was very steep but it taught me a great deal and confirmed oak (Quercus robur) as my favourite wood to carve with,", he says. 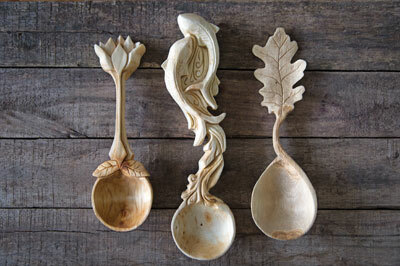 Giles explained that his carving work is directed by a set of self-imposed creative and practical constraints: "Each piece must be a functional spoon, suitable for daily use and comfortable in the hand. This constraint ensures that I don't let the complexity of my designs compromise the functional premise of the carving. Creatively this gives me a firm foundation on which to design. Knowing that there must be a bowl and a handle of some sort helps me avoid the 'blank canvas' feeling. My designs always start with the bowl and work out from there." The tools he chooses to work with provide one of the practical constraints: "I only use traditional hand tools; a Gransfors Bruks Small Forest axe for cutting out the basic shape of the spoon, a Morakniv Companion Knife to clean up the axe work, a pair of Morakniv Hook Knives to carve out the bowl and a small selection of Flexcut knives, gouges and scorps to add the details." However, as well as being a constraint, using only hand tools also offers Giles greater freedom: "Without a reliance on powered tools I don't need a workshop and can work anywhere. I love the freedom that this provides me and I predominantly do my carving outdoors, either at home or in the woods, all year round. This connection to the outdoors and the natural world fuels my imagination and gives me endless inspiration for my work." 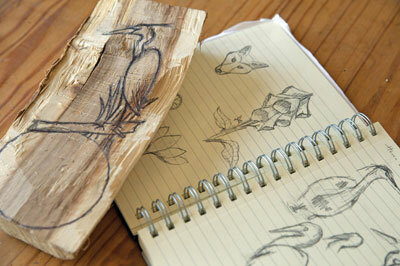 Most of his inspiration comes from nature and time spent in the outdoors. "It is both my need to feel a connection with the outdoors and to create something tangible and functional that drives me. I try to capture the detailed nuances of the natural world around me in my carvings as well as incorporating my own interpretation of the traditional, strong symbolism that has been so central to woodcarving for thousands of years." He is also influenced by a wide range of art movements and individual artists, from Art Nouveau's highly ornate and decorative style to the powerful, symbolic aesthetic of traditional Japanese and Native American art. "The work of a very broad range of artists inspires me, like Georgia O'Keeffe and Alphonse Mucha, contemporary designers like Si Scott and craftspeople like Robin Wood, Martin Damen, Luke Hope and Louise Hibbert." Social media also has a great influence on Giles' work: "Another source of endless inspiration and support has been the global community of artists and craftspeople that I have come into contact with through social networks like Instagram. The work that they share is such an inspiration and their support of my carving has motivated me to take my work in new directions." Giles likes to take a traditional approach to his work: "My working methods are probably more akin to traditional green woodworkers of centuries past than modern woodcarvers; more as a result of the way that I taught myself to carve rather than a conscious decision. I predominantly work outdoors, I don't have a workshop, use only basic, unpowered hand tools and source my timber locally and from the woodland that I help to manage in North Wales. 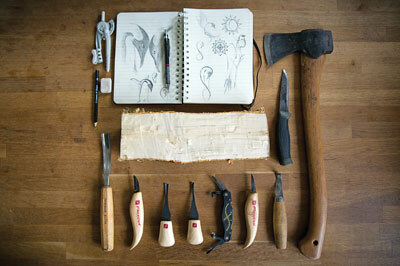 It is this connection with the outdoors that drives and inspires my woodcarving," he says. "My approach to carving is a combination of an urge to explore my own creativity, my use of purely traditional hand carving techniques and a self-imposed requirement that function comes before form." He aims to make every spoon beautiful, functional and unique. "I decided, when I first started on this carving journey that each spoon would be individually designed and that I wouldn't repeat or reproduce any designs that I've done before. The main reasons behind this decision are that I'm always looking to challenge myself, my abilities and my understanding of wood and also because I wanted to avoid my carving becoming effectively a factory process. By following this principle I'm free to explore new concepts, subjects, shapes and woods on a regular basis. I enjoy the challenge of finding the balance between the delicate sculptural appearance of my spoons and the function for which they are designed." 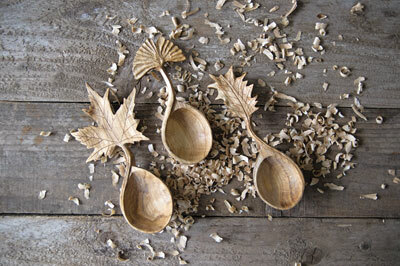 He is currently working on his first spoon series, which will focus on leaf shapes and patterns. "The concept of doing a series is interesting for me since making each one unique but, at the same time, aesthetically in keeping with every other is an enjoyable challenge. I'm also planning to follow this up with another, animal-based series. Looking further into the future, I would love the opportunity to take my carving passion full-time and maybe one day have the chance to exhibit some of my work." We look forward to seeing the results as Giles' carving goes from strength to strength!